No water, chemicals or heat. Natural pectins and waxes absorb oil. Soft, comfortable, natural and hypoallergenic. an affordable option for a wide variety of wipes. wipes by their preferred brand and at price parity. would NOT be a barrier to trial and useage. Topsheet application research substantiates superior performance of natural cotton spunlace materials. "Electrokinetic properties of functional layers in absorbent incontinence nonwoven products"
"Electrokinetic analysis of hydroentangled greige cotton-synthetic fiber blends for absorbent technologies"
hemostatic properties and reduction of chronic wound inflammation. "Modified cotton gauze dressings that selectively absorb neutrophil elastase activity in solution"
"In vitro hemostatic, hydrogen peroxide production and elastase sequestration properties of nonwoven ultra clean greige cotton dressing"
Southern Research Center, Agricultural Research Service, USDA, New Orleans, LA 70124. "Emerging Concepts in Nonwovens Dressings" Nonwovens Report International Issue 4 2013. 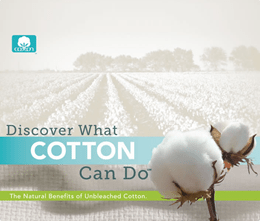 The Natural Benefits Of Unbleached Cotton. A&apos;S COTTON PRO9l&apos; RS AND IMPORTERS. Service Marks/Trademarks of Cotton Incorporated.